Of the 224 000 rated entities doing business in Slovakia the demanding criteria of evaluation meet only 1.2% of enterprises. 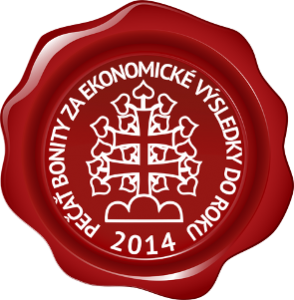 We are proud that the company ŠPEDSERVIS, Ltd. owns “signet Bonita 2014” and this way belongs among Slovak creditworthy businesses. You can always check the information on the web site SIMS after entering the identification number of our company (http://www.sims.sk/slovenske-bonitne-podniky/) or look at the TREND SPECIAL No.45, (dated 5.11.2015). The evaluation model focused on the creditworthiness of commercial entities operating in the territory of the Slovak Republic have developed Slovak Information and Marketing Company, Inc. and National Information Centre of the Slovak Republic, Joint Stock.